VANCOUVER BRIDGES ARE LIKE THE BAD BOYS IN CLASS, SUSPENDED. 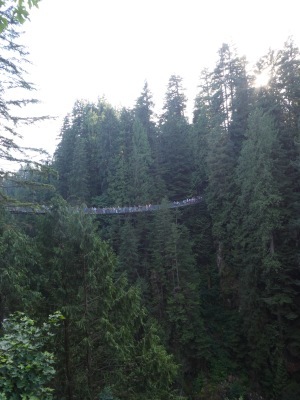 Capilano Suspension Bridge, avoid those hectic lines go before 10am or after 5pm. Go after 5pm during the summer months tickets are discounted. Students, remember to bring your ID they offer student discounts. After you cross capilano there is a treetop adventure, the rainforest, a cliffwalk, and trees so tall you almost can't see the tops. 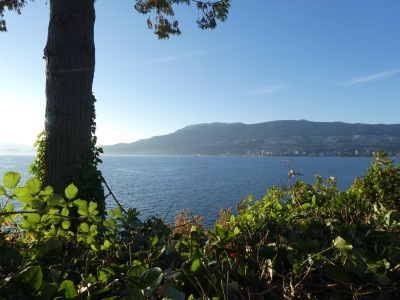 stanley park, can i move in​ & snuggle the otters? 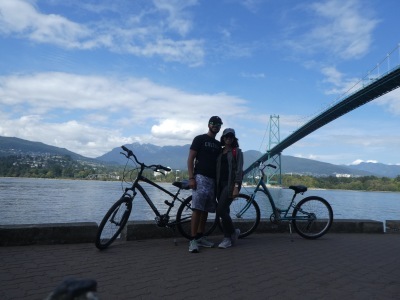 If one day you decided to take a romantic bike ride around the scenic views of stanley park, somehow end up in the middle of the forest for way too long, approaching one way trails and dissapointment because all you want is to go the opposite direction, fear not, you are doing stanley park the right way! Stanley park is huge and it has many sights including giant todem poles, beaver lake (no beavers were seen on our journey to beaver lake) the vancouver acquarium, lost lagoon, hollow tree, and so much more. When biking near the water keep an eye out because we saw three beautiful otters swimming right next to us. They do not rent bikes inside the park, however on Denman Street there are numerous places to rent bikes for the day. I suggest parking in the area were you rented your bike because it is very difficult to move your legs properly after returning your bike.